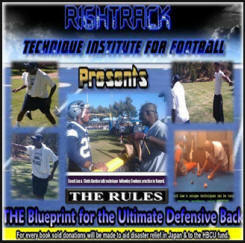 Coaches' Corner Volume 37 - Defensive Back Play with Coach Robert Lee Jr. Coaches' Corner Volume 37 - Coach Lee brings his unique system for coaching Defensive Backs to this edition of Coaches Corner. Coach Lee discusses his book, "The Blueprint for the Ultimate Defensive Back" and a number of the concepts he teaches to "break down a wide receiver".